Why I am getting Likes/Followers/Views SLOWER? Why I stop receiving Likes/Followers/Views? KingdomLikes have thousands of users per day and is based in a Competition System so the users that have more POINTS, a better CPC(Cost Per Click) or are a VIP Users, will get the likes faster and before you. So if you want to get likes faster and before other users, only do the following tips. Our algorithm detects users who have more POINTS and send more likes than the users who have only a few points. So if you want likes much faster only get more POINTS. We give priority to Sites/Pages that have a higher CPC(Cost Per Click). So the users that set a CPC of 10 or more will get the likes faster. - The lowest CPC is 6 and the higest is 10 for a NORMAL USER. - The lowest CPC is 4 and the higest is 15 for a VIP USER. The users that are VIP have priority to get the likes, to become a VIP user you only need to buy one of our packages. I deleted a Site/Page. How can I re-add the Site/Page? Click on "Show delete Sites". Click on the lock of the site that you want to re add. 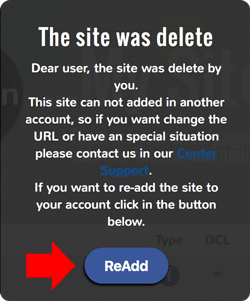 Click on the Re-add Button and your site will re-add. When I try to add my Site/Page said me that "The page/site already exist." It's simple, as our system said, the Site/Page was added with another account, no matter which have been removed from the other account, you can't translate Sites/Pages to another account unless you are a VIP USER. To become a VIP user you only need to buy one of our packages. How to transfer one site to another account? You need to be a VIP User to transfer sites/pages to another account, if you are a VIP User contact us in our Center Support to transfer the site/page. How to become a VIP User? To become a VIP user you only need to buy one of our points packages.